A powerful, revealing story of hope, love, justice, and the power of reading by a man who spent thirty years on death row for a crime he didn't commit. 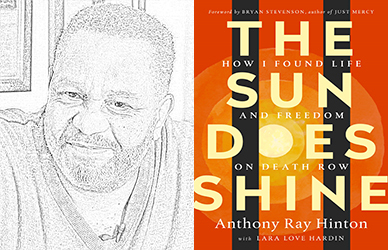 In 1985, Anthony Ray Hinton was arrested and charged with two counts of capital murder in Alabama. Stunned, confused, and only twenty-nine years old, Hinton knew that it was a case of mistaken identity and believed that the truth would prove his innocence and ultimately set him free. But with no money and a different system of justice for a poor black man in the South, Hinton was sentenced to death by electrocution. He spent his first three years on Death Row at Holman State Prison in agonizing silence―full of despair and anger toward all those who had sent an innocent man to his death. But as Hinton realized and accepted his fate, he resolved not only to survive, but find a way to live on Death Row. For the next twenty-seven years he was a beacon―transforming not only his own spirit, but those of his fellow inmates, fifty-four of whom were executed mere feet from his cell. With the help of civil rights attorney and bestselling author of Just Mercy, Bryan Stevenson, Hinton won his release in 2015. With a foreword by Stevenson, The Sun Does Shine is an extraordinary testament to the power of hope sustained through the darkest times. Destined to be a classic memoir of wrongful imprisonment and freedom won, Hinton’s memoir tells his dramatic thirty-year journey and shows how you can take away a man’s freedom, but you can’t take away his imagination, humor, or joy. Part of the Tom and Marla Corts Lecture Series.